It’s December already! Where has the year gone? Either way, this time of year is my favorite. Fires crackling in the fireplace, beautifully decorated and lit Christmas tree, all the Christmas lights on people’s homes, the music…and of course, the food. Ironically, this is the time of year that I tend to lose a few pounds. Why? Because I’m so determined NOT to gain those extra holiday pounds, that I tend to go in the opposite direction, yet still allowing myself to indulge in some of my favorite foods. Yes, I’m a rebel. Last year after making some eggnog cupcakes, I decided to experiment with more eggnog recipes this year. So, here is the first! These cookies actually taste very similar to the sugar cookies that my mother-in-law has made before, and I couldn’t stop eating those…and naturally, that was the case with these. Oh, except they have extra colored sugar crystals on top. More sugar? Yes, please. Preheat oven to 300 degrees. Combine flour, baking powder, cinnamon, and nutmeg. Cream sugar and butter until light and fluffy. Add eggnog, vanilla, and egg yolks, beat at medium speed with electric mixer until smooth. Add flour mixture and beat at low speed until just combined, do not overmix. 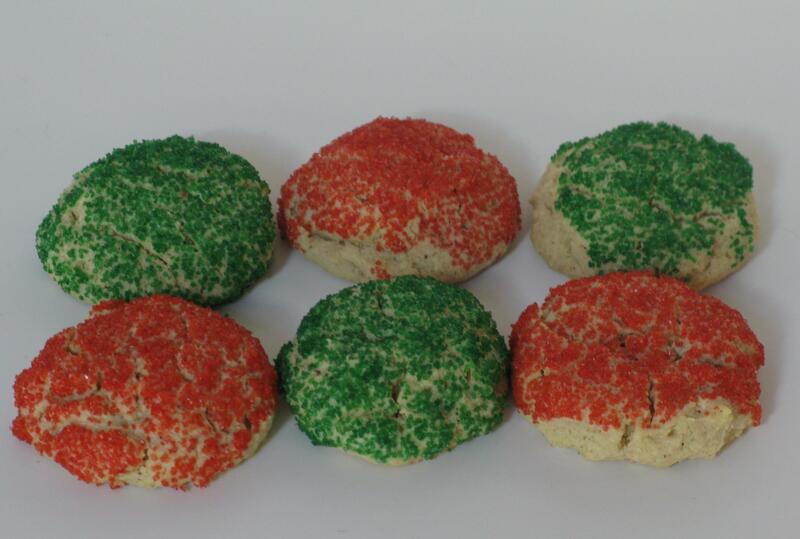 Using cookie scoop, form cookie dough into balls before rolling in colored sugar crystals, then drop batter so that they are 1 inch apart on baking sheet. Bake 20-23 minutes.